Following a consultation exercise in the of summer 2016 an NASC working group was formed to review feedback and agree modifications and amendments to TG20:13 at time of next revision. A consultation document was circulated to all NASC member companies and also to purchasers of TG20:13. Users and purchasers were invited to propose amendments to TG20:13 which they would like to see incorporated at time of next revision. Suggested amendments included varying the number of boarded lifts, production of basic drawings and calculations, and increased leg load information. It was also suggested that modifications might be made to the TG20 compliance sheet, for example incorporation of postcode, unique scaffold number and seasonal information. The principal purpose of the consultation exercise was to enhance TG20 guidance with a view to improving safety and efficiency. Unsurprisingly the exercise generated a considerable number of responses, many of which were quite detailed. Working group meetings took place in September and November of 2016 to consider the merits of suggestions received, based on consolidated feedback prepared by the technical authors of TG20:13, CADS (Computer and Design Services Ltd). A third working group meeting is scheduled in March 2017. In the first instance the aim of the working group was to classify suggested amendments and modifications to TG20 on the basis of (1) desirability and (2) ease of implementation. It was agreed that ‘quick wins’ should be incorporated to a software upgrade for issue free of charge to existing users of TG20:13. It is envisaged that the software upgrade will be issued in the spring of 2017. More substantive changes will then be agreed for incorporation to an updated version of TG20:13 at time of full review. The timescale for full review has not been agreed. However it is unlikely that a fully updated version of TG20 will be published for at least two years. 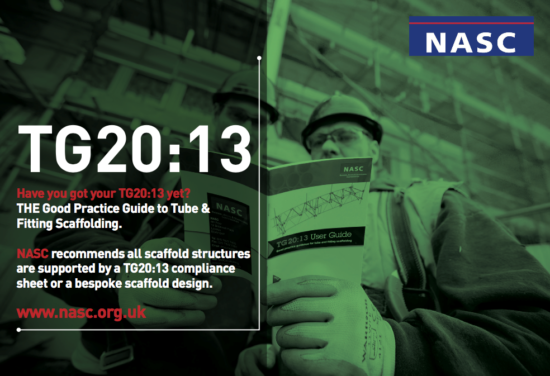 Further to the above, and as TG20:13 has been widely adopted throughout the UK scaffolding industry and the wider construction sector both in the UK, and increasingly abroad, it has been agreed that now would be an appropriate time for NASC to announce a review of the existing TG20:13 publications pricing structure. Accordingly it has been announced by the NASC that with effect from 1 March 2017 all TG20:13 publications will be half price, with the exception of the TG20:13 pocket user guide. This price reduction will apply to NASC members and also to non members. TG20:13 was originally launched in April 2014. CISRS in collaboration with three of its accredited training providers will be running a series of pilot courses next month for its new Continuing Professional Development (CPD) course, which is set to go live on 1st of July 2017. National Construction College Midlands will run the first of the pilot courses at its centre in Birmingham on 15th and 16th February. CISRS will be looking for scaffolders whose card is due to expire in 2017 to attend the (free of charge) pilot courses. And further courses will take place at NCC Midlands on 15th/16th March and 24th/25th April. CISRS accredited providers Safety and Access and Simian Skill are also looking to set dates for further pilot courses to be delivered at their centres in Nottingham and Warrington respectively. Each of the CISRS accredited providers looking to offer CPD training will also be requested to have one of their instructors attend a pilot course, so they can bring themselves up to speed with the content and delivery of the new two-day course. The course will include a general scaffolding update – covering the relevant technical and safety guidance notes, such as SG4, SG6 & TG20 – as well as a scaffold inspection and an aluminium tower module, which if completed successfully can then be endorsed on the rear of the new card. A health and safety test will also be included, which if the delegates pass will negate the need to complete the CITB Health and Safety and Environment test. To assist in this new training module, a bank of health and safety questions will be issued to CISRS CPD delegates prior to attending the course. Around 4,000 scaffolders will need to renew either their Scaffolder or Advanced Scaffolder card in 2017 and more than half of these hold cards which will expire prior to 1st July – and as such will renew under the current scheme requirement of completing the CITB Health and Safety and Environment Test or a recognised exemption, not the new CPD. Card renewal reminders are issued to cardholders three to six months prior to the card expiry date and CISRS envisages that a number of scaffolders may renew their card early in order to beat the 1st of July CPD course deadline. To find out more about the new CISRS CPD courses, obtain a copy of the CISRS CAP 609 General Information Booklet, new cards poster or to find out more about CISRS, please visit www.cisrs.org.uk or email enquiries@cisrs.org.uk.